Linda took her friend, Diane, out to lunch to celebrate a special birthday. She read reviews of new restaurants, took a look at menus and prices, booked reservations, looked up directions to the restaurant, and estimated driving time. She sent a birthday card to Diane, bought a present for her and had it gift-wrapped. The day of the celebration, Linda checked the weather forecast. At lunch, the two friends shared photos of their recent vacations. They commemorated the occasion with a picture of the two of them together. When Linda got home, she sent a copy of the picture to Diane, and posted it to other friends on FaceBook. They responded, with happy birthday wishes to Diane. All of these transactions were done on Linda’s smartphone. Smartphones and tablet computers make our lives easier --- and more fun! A recent study from the Pew Research Center found that the fastest growing sector of smartphone users is people 65 and older. Forty two percent use smartphones, 32% own tablet computers, 67% are on the internet, and 34% are on social media, such as FaceBook or Twitter. The Pew study also found that people 65 and older say that a lack of familiarity with technology and applications poses a barrier to getting online. Once someone shows them the ropes, however, they are active users. Three quarters of 65+ tech users are online daily. 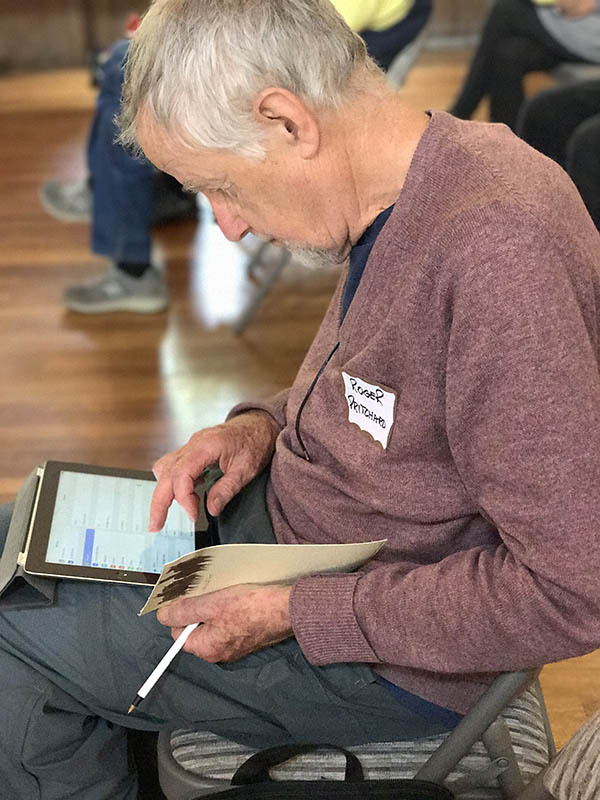 On June 7, 2017, the Technology Team offered an iPhone and iPad workshop, lead by Sharon Beck, a retiree who, at 66, started a new career in technology support and training at Apple. She now offers training and online information through Mac-Senior to help seniors become confident technology users. Sharon covered a wide range of topics with 35 members and volunteers in attendance. The agenda included an orientation to the iPhone and iPad devices, IDs and passwords, wireless access, use of popular Apps, identifying scams, managing photos, the “magnify” feature and other options to improve accessibility. She also answered specific questions from the audience. Audience evaluation of the training mentioned specific new skills that were mastered. Suggestions? Take us to the next level!